Our practice is committed to bringing the safest and highest quality of care to our patients. The installation of our new digital X-ray system continues that commitment. Using the state-of-the-art DEXIS system enables us to provide greatly improved diagnostic capabilities to our patients while significantly lessening their exposure to radiation by up to 80 percent over the old film X-rays. We know this will be very important to many patients. While traditional film X-rays have been the standard for diagnosing dental problems for the past 90 years, digital X-rays offer substantial benefits over film. Our patients find that the x-ray process is more comfortable than film. Digital x-rays are also a real time-saver over the old technology. 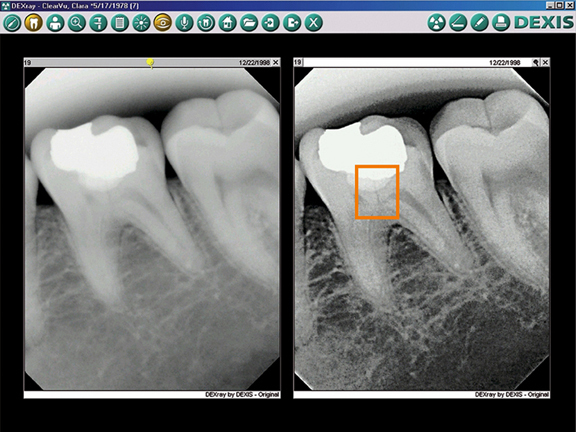 Digital X-ray technology also enables our patients to see their dental condition for themselves. 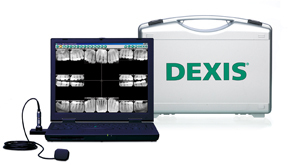 The digital X-ray image is instantly displayed on a large computer screen and can be enhanced and magnified to show conditions such as cavities or structural weaknesses in teeth. It's a wonderful tool for helping patients fully understand their treatment options. The x-ray on the left is not digitally enhanced.The x-ray on the right is digitally enhanced. If you look closely inside the orange box you will see a crooked vertical line. This line represents a fractured tooth that is unrestorable and must be extracted. It is this type of detail and information that we are able to view with digital x-rays. Dr. Roberto Russo graduated in dentistry and oral surgery, top of his class, from the University of Catania(Italy) in 1988.